Financial Aid to assist families in paying college costs (News Flash – College is EXPENSIVE!) 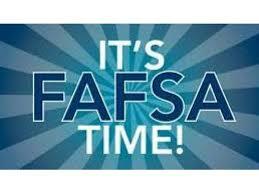 starts with completing the FAFSA. Good News – This application has been and still is FREE! There are typically changes made to the application or process annually with the goal of making access to Federal Aid and College easier. That being the case, new things can throw people off. Don’t lose your balance this year. *** Think you make too much money to qualify for “Financial Aid”? Think again! Income is a large factor, but not the only one in the formula. Why not “know” instead of “think”? And, it’s FREE to apply! *** Afraid it is too complicated and time consuming? 30 minutes, even an hour or 2 to potentially reduce your college expenses doesn’t seem like too much time to invest. Have questions? Help is available. Don’t be scared, you can do it! And again, FREE! *** Don’t have your taxes done yet? 2016 Tax Info NOT 2017! This is an old excuse for kicking the FAFSA down the road. You’re ready to go and the “IRS Data Retrieval Tool” can make this even easier. Did I mention, FREE! Good luck! If you have a question or need some encouragement, give us a call 704-564-1955.